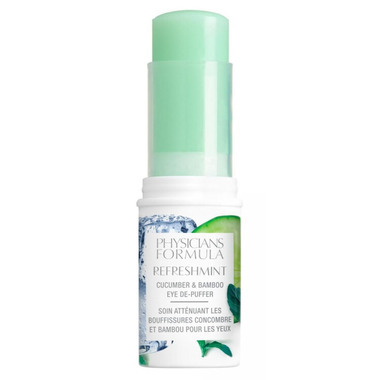 Physicians Formula Refreshmint Cucumber And Bamboo Eye D-Puffer is a cooling, hydrating, and fast-absorbing treatment stick for an instant pick-me-up! 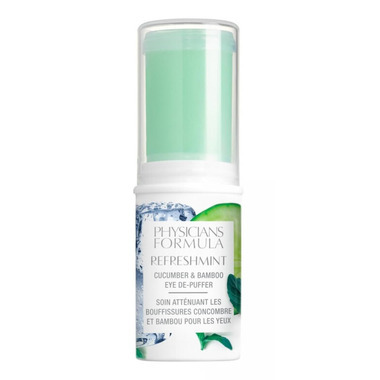 A skin-nourishing blend of green ingredients include: peppermint, cucumber, and aloe vera cool skin to visibly reduce the appearance of tired eyes, while hydrating bamboo shoot and glacial mineral water refresh skin. Usage: Apply around eye area to reduce the appearance of puffiness. Apply to entire face and neck to cool and refresh. For best results, replace inner cap after every use. Ingredients: Water/eau, Butylene Glycol, Sodium Stearate, Bis-peg-18 Methyl Ether Dimethyl Silane, Adipic Acid/neopentyl Glycol Crosspolymer, Hamamelis Virginiana (Witch Hazel) Water, Glycerin, Niacinamide, Saccharomyces Cerevisiae Extract, Peg-12 Dimethicone, Pentylene Glycol, Caffeine, Phenoxyethanol, Phyllostachis Bambusoides (Bamboo) Extract, Sea Water, Caprylyl Glycol, Dimethicone, Menthone Glycerin Acetal, Menthoxypropanediol, Ethylhexylglycerin, Vp/va Copolymer, Chondrus Crispus Extract, Allantoin, Dipotassium Glycyrrhizinate, Water/eau (Glacier), Hexylene Glycol, Amodimethicone, Hydroxypropyl Methylcellulose, Disodium Edta, Aloe Barbadensis Leaf Juice, Chlorphenesin, Gluconolactone, Benzoic Acid, Cucumis Sativus (Cucumber) Fruit Extract, Mentha Piperita (Peppermint) Leaf Extract, Sodium Hyaluronate, Sodium Benzoate, Blue 1 (Ci 42090), Yellow 5 (Ci 19140). Very disappointed with this product. I does not do what it is advertised to do.